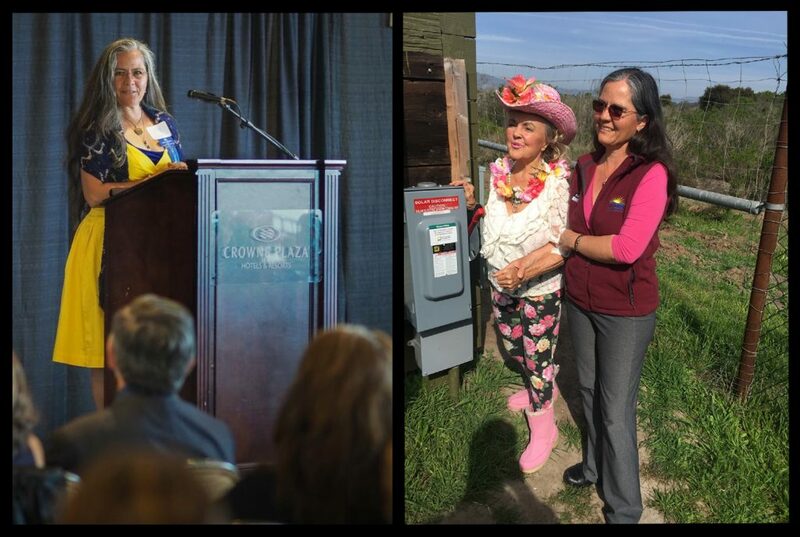 Sun Pacific Solar CEO Cecilia Villaseñor Johnson addressing the crowd at the Pacific Coast Business Times Latino Business Awards ceremony (left), and with Patricia Bragg (right), owner of the locally based Bragg Farms where SPSE installed solar. At the March 2019 SunPower conference, we were pleased to attend the second annual Women in Solar Breakfast where guest speakers Nam Nguyen (Executive VP and general manager of SunPower’s commercial solar division) and Jeanine Cotter (President & CEO of Luminalt) discussed the challenges of being a woman in the solar industry. The discussion addressed a number of obstacles facing women in solar including mansplaining (a man cutting a woman off to explain something she is perfectly capable of expressing), being heard, and trusting yourself, as well as finding a good work/life balance, having mentors, being a mentor to others, and supporting one another. Both Nam Nguyen and Jeanine Cotter are inspiring women with impressive bios. Cotter began her career as an environmental lawyer, but decided she wanted a more hands-on approach to environmentalism. She got a contractor’s license and co-founded Luminalt Solar Energy Solutions in 2004. She is on national and local committees working to establish solar industry standards, renewable energy advocacy, the creation of inner city jobs, small businesses and sustainable business practices. In 2013, she was selected to join the Board of Directors of CalSSA (California Solar and Storage Association). Nguyen joined SunPower in 2013 as VP of strategy and new market development, before which she was VP of global business development at First Solar where she financed about four gigawatts of project assets. She has worked in investment banking, holds an MBA from Harvard and a BA from Columbia University in economics. Being one of only two women among nine male executive officers, Nguyen knows something about being outnumbered and not feeling heard at times. She stated that while she has found mentors in her journey to Executive VP, she sometimes has to stop and say “You’re not hearing me,” and restart the conversation at board meetings. But her executive position has also given her the opportunity to improve the gender bias in the workplace. As VP of SunPower’s commercial division, Nam Nguyen has taken the lead in eliminating the work place gender bias by proposing and enforcing a new policy of taking the names off of job applications before screening them. And, would you believe it? More women are getting hired! Other solar manufacturers such as Schneider, BayWa, and Outback Power have also taken the step to promote and recruit more women onto their teams. But a lot more progress still needs to be made. Only 5% of fortune 500 companies have female CEO’s. Worldwide only 11% of board members for energy companies are women. In the United States, there are only 6% of women CEO’s in energy firms. One quarter of publicly traded companies in California don’t have a single woman on their board. Thankfully, California aims to set an example and passed a law in October 2018 stating that if a company is publicly traded, it must have a set number of women on its board of directors. The minimum is two female directors if the company has five directors on its board, or three women if it has seven directors. By 2019 companies must have at least one female director and if the minimum number of female directors aren’t represented by 2020, companies will be fined $100,000. Subsequent violations will incur a $300,000 fee. As a woman and minority owned business, we found Nam Nguyen, Jeanine Cotter and the Women in Solar Breakfast very inspiring. Sun Pacific Solar is proud to be NWBOC (National Women Business Owners Corporation) Certified as well as a member of WISE (Women In Solar Energy). Our company as well as our CEO, Cecilia Villaseñor Johnson, have received a number of awards and recognition for achievements in the solar field and we aim to continue educating, increasing green energy, and being a leading female voice in our local community. Have you thought about driving on sunshine?